With a cast as great as New Year’s Eve’s, you’d think the film would be an easy sell for those of us who love a bit of romance in our movies around the holidays. But if Valentine’s Day has taught us anything, it’s that a huge cast of familiar names and pretty faces does not guaranty a hit. That said, are the burns of V-Day so scarring that we won’t be drawn back to the theater to see which of New Year’s Eve’s characters have “falling in love” on their list of resolutions for the new year? Speaking for myself, no, probably not. I’m a sucker for romance and always on the look-out for films that might actually come close to the humor and heart seen in Love Actually. The Richard Curtis film embraced its excellent cast and proved to be a fine example of a feel-good comedy focused on the subject of love. New Year’s Eve looks like it’s headed in that direction, but then again, so did Valentine’s Day. The poster for New Year’s Eve sells romance in New York with couple sharing an embrace and the New Year’s Eve Times Square ball in the background. The whole thing is tinted in gold, and in case the long list of celebrity names isn’t grabbing your attention, their faces are lined up at the bottom. The poster also points out that the film is by the director of Pretty Woman and Valentine’s Day. Despite my dislike of Valentine’s Day, I'd say Garry Marshall has certainly directed enough winners over the course of his career to earn the benefit of the doubt on this one. Or maybe I'm just easily sold by shiny gold posters, romantic stories and exceptionally pretty casts. 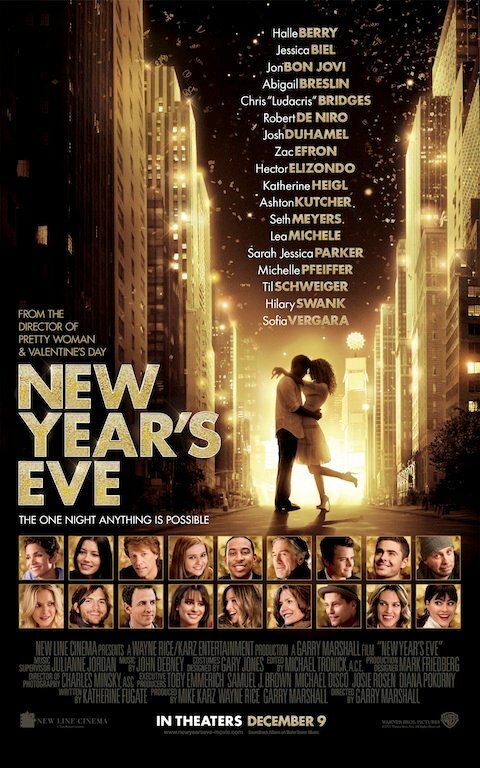 New Year’s Eve hits theaters on December 9th. You can read more about the film in our movie database here.